Last week, Dwell visited this year’s fall edition of the design and interiors trade show Maison & Objet. The exhibitors booths are spread over nine huge, design-filled halls at Paris’s Parc d’Exposition. There, visitors can expect to find everything from furniture to lighting to home fragrances. Unlike January's Maison & Objet, the September show boasts a dedicated outdoor furniture section showcasing products for the coming spring and summer seasons. The sun was shining and the design aficionados were out in force as we set off, camera in hand, to seek out the best new products. 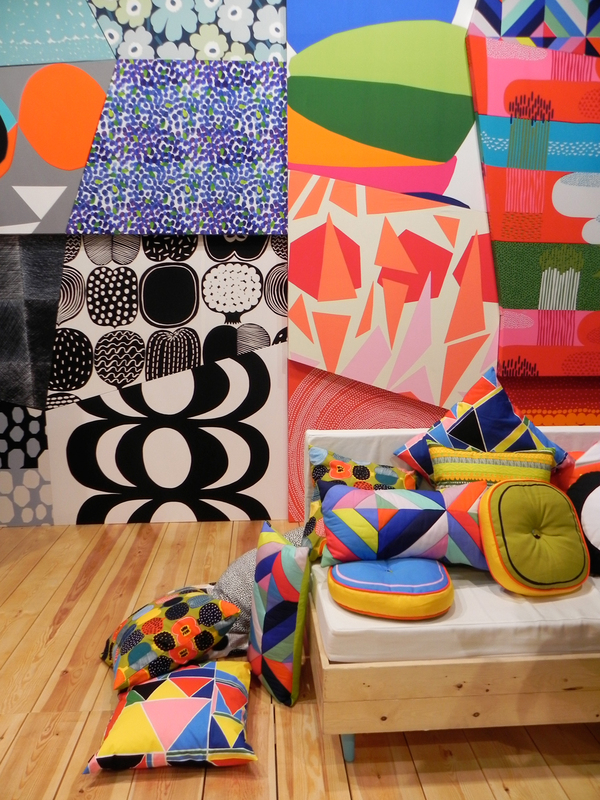 Making their usual colorful appearance at the show was Finnish textile brand Marimekko, who displayed rhombus-shaped swatches of the new season’s fabrics across the walls of their booth like a giant psychedelic jigsaw. French ceramic studio Atelier Polyhedre showcased a series of angular terra-cotta vessels appropriately called Zag, which are all made at their studio in Nantes, France. We first saw the Plan vases by Barcelona-based designer Sebastien Cordoleani for Moustache at the January edition of Maison & Objet. They were previously only available in eye-wateringly expensive carrara marble or Italian slate, but this season the French brand introduced a more affordable ceramic version, lowering the price tenfold from €400 to €40. Named after the ring that appears around the sun during a total solar eclipse, the wall-mounted Halo lamps by Nina Bruun were exhibited on the Danish Crafts Collection stand. The Halo lamps’ LED bulb reflects light off the coated-steel and copper diffusers to throw out a gentle glow onto the wall. One of our favorite ranges from the outdoor section was Organic by Thai brand Plato. Brightly colored steel frames support interchangeable sling seats made using woven outdoor fabrics imported from Italy. Donna Wilson continues the expansion of her housewares line for British brand SCP with these new Fort trays. Made in Sweden, the pattern is designed to resemble tiny medieval castles (hence the name) but we think they look like tribal feather headdresses. It’s hard to get us excited about cleaning products, but Andrée Jardin has managed it. Showing for the first time at the show, the 60 year-old French brand’s wood-and-horsehair brooms and brushes are a perfect meeting of tradition and modernity. We especially like the magnetic storage solution. Their unique selling point? “Nowadays, it is difficult to find a real broom, a genuine épousette or a reliable brush.” they explain. Made with a wooden clamp and a surprisingly squeezable silicone shade, the flexible Softclamp lamp by Italian brand Seletti can be fixed onto any hard surface. Color Box, by Danish design brand Normann Copenhagen, is a range of folded steel storage compartments that can be hung on the wall or stacked up on the floor like building blocks. One to watch is Taiwanese tableware brand Toast, who presented some clever, double-wall porcelain coffee cups with built-in silicone filters so one can enjoy their special roast anytime, anyplace. Representing Iceland was Ihanna Home founded by Icelandic designer Ingibjörg Hanna. We love her tea towels and pillows that feature a wayward pinstripe design. It was great to see designs by homegrown, American design talents Fort Standard and Bec Brittain gracing the SCP stand. This is Fort Standard’s Sprue candelabra made from bronze. Swiss brand Zak!Designs used recycled melamine to make a range of unexpectedly modern, nesting bowls for the kitchen called Bols Confettis. Zuzunaga also introduced the pixel-inspired Bitmap collection. Three designs called Shanghai, Barcelona, and Tokyo clash and contrast colors to optimal effect. These precarious-looking shelves by Damien Gernay were a new introduction for Parisian brand ENO. Called Lumberjack, the shelves are an adjustable modular design made up of steel parts and solid oak planks. Italian brand Skitsch was already thinking ahead to next year’s Salone del Mobile as they previewed Critter, a movable, all-in-one kitchen unit design that will be officially launched at the 2013 edition of the fair in Milan. The eight-foot-long, modular piece is the work of Milanese designer Elia Mangia and consists of a sink, two burners, and storage space for pots and pans under the countertop. It might surprise you to learn that it's all held together with just eight screws. Already previewed in Milan earlier this year, we love the mid-century feel of Jaime Hayon’s new chair for Danish brand &Tradition. Taking pride of place at the front of the &Tradition booth, the chair is still under development, so this is sadly just a prototype but we look forward to its official launch next year.